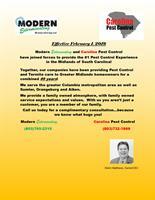 then continued to grow and expand in the pest control industry. Matthews, owner and president of Modern Exterminating, Inc. This is the second company purchase for Modern Exterminating in the past 3 months. leader in the pest control industry.